Those of us here at Techlicious have always liked Neat’s line of scanners and the cloud-based system that supports them for home office use. With Neat, documents aren’t just saved as an image – they’re IDed and read, with relevant information automatically extracted, categorized and saved in a searchable database. You can even import items into Excel, Quicken and TurboTax with relative ease. It’s a smart system. But it’s always required a stand-alone Neat scanner that’ll eat up valuable home office real estate. Always, that is, until now. This week, the folks at Neat and Hewlett Packard announced a partnership to put Neat smart scanning technology right into your next home office printer. It’s first collaboration, the net-connected HP Officejet 8040 with Neat e-All-in-One, is a top-of-the-line tool that prints (14PPM black; two-sided), copies, faxes, scans and comes with a free 3-year subscription to the cloud-based Neat document organization service. Beyond the basic features you’d expect in a multifunction printer, the HP Officejet 8040 with Neat comes with a 3.5” capacitive touch screen and 1TB hard drive so you can store and print documents locally too. You can print documents directly from your smartphone using the HP app (iOS and Android), or if you have an Android device with NFC, you can take advantage of the machine’s tap-to-print feature. The HP Officejet 8040 with Neat is also eligible for the HP Instant Ink subscription plan which automatically mails you new cartridges when the ones in your printer start getting low. HP Instant Ink plans start at $2.99 per month, which covers 50 printed pages. 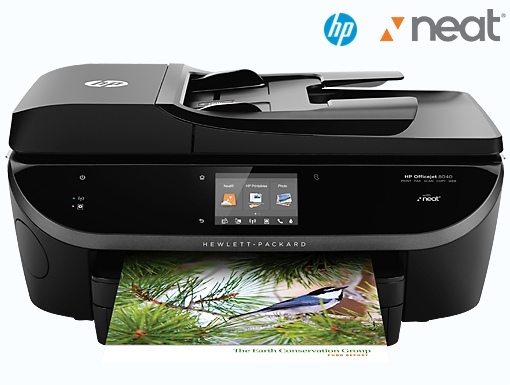 The HP Officejet 8040 with Neat e-All-in-One is currently available with an MSRP of $399.99. It includes a 3-year Neat cloud service for HP subscription (a $216 value) with up to 45 pages of OCR searchable scans per month; fees will apply thereafter. Many features require a home Internet connection.